The League of American Bicyclists has announced their Bicycle Friendly Community (BFC) winners for 2016. Three new Bicycle Friendly Communities as well as four Honorable Mentions have been awarded in Illinois. 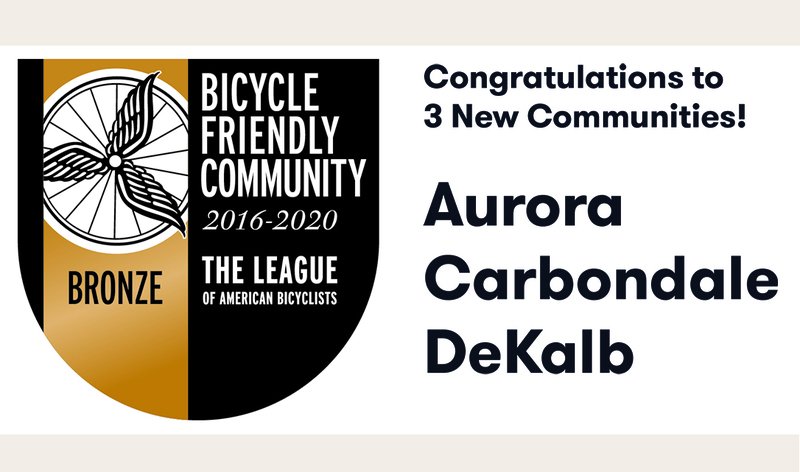 Aurora, Carbondale, and DeKalb were awarded with Bronze Level Bicycle Friendly Community designation. Glen Ellyn, Highland Park, Springfield, and Washington received Honorable Mentions in their efforts to become Bicycle Friendly Communities. Evanston and Schaumburg successfully renewed their BFC designations at Silver and Bronze levels respectively, demonstrating their commitment to maintaining their bicycle friendliness. BFC designation requires renewal every four years. The application process for becoming a BFC or securing a higher level designation is rigorous and successful communities have a mixture of determined citizen advocates, visionary leaders, and responsive staff each doing their parts to build a Bicycle Friendly Community for all. Ride Illinois has had a long history of involvement with this city’s bike friendly initiatives. We’ve provided guidance and technical expertise on bicycling issues, and led efforts behind the Bike Friendly Community application and formation of the city’s Bicycle and Pedestrian Advisory Committee. We have also assisted with grant applications, creation of bike maps, safety education, and more. Ride Illinois worked as a sub-consultant on their 2016 bike plan; some of which has already been implemented. (link to story) We also advised the city on strategies and priority action items they should undertake in seeking this year’s Bike Friendly Community designation. We advised DeKalb on various strategies and action items in their efforts to become a Bicycle Friendly Community. DeKalb has also participated in our annual Mayor’s Bike Safety Challenge. Schaumburg was the first town in Illinois to receive BFC designation, and has long been committed to maintaining their bicycle friendliness. We produced a Bike to Metra guide for Schaumburg in 2013 to encourage bicycle commuting. Schaumburg has also participated in our annual Mayor’s Bike Safety Challenge, and joined our Illinois delegation at the National Bike Summit in D.C. last year. As a Silver level BFC, Evanston is among the top bicycle-friendly communities in our state. They’ve participated in our annual Mayor’s Bike Safety Challenge and encourage the use of BikeSafetyQuiz.com as an educational tool in their community. In 2014, Ride Illinois produced Bike-to-Metra guides for Glen Ellyn to encourage bike commuting. Glen Ellyn has also participated in our annual Mayor’s Bike Safety Challenge. Recently, Ride Illinois is currently working with Highland Park on the installation of dozens of new “State Law – 3 Feet Minimum to Pass Bicyclists” signs for early 2017. We’ve also created Bike-to-Metra guide, helped shape a ticket diversion program with the use of BikeSafetyQuiz.com, and helped them promote their involvement in our Mayor’s Bike Safety Challenge. Ride Illinois was the bike planning consultant for Springfield’s overall bike plan in 2012. 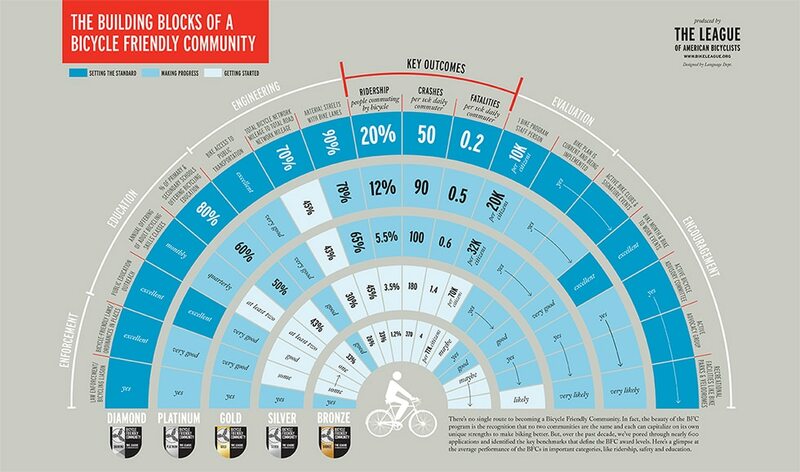 We have been advising on strategies and action items in their efforts to become a Bicycle Friendly Community since then. Over the past year, Ride Illinois has engaged with Washington’s Bicycle Advisory Committee and advised on strategies and assisted action items in seeking BFC designation. The League of American Bicyclists welcomed 26 new and 77 renewing Bicycle Friendly Communities throughout the US. This was the largest application round in the BFC program’s 13 year history. In total, 140 communities applied for recognition, a 62 percent increase from the previous largest round. There are now 404 BFCs in all 50 states. To learn more about the League of American Bicyclists Bicycle Friendly Community program, visit bikeleague.org/community. Learn more about how Ride Illinois can assist your town in becoming a BFC.